I made a false start when I first picked up Amanda Ortlepp’s Running Against the Tide. I’m not sure of the mood I was in, but the idea of a woman running away with her two teenaged sons to a remote part of South Australia to escape an unhappy marriage didn’t instantly appeal to me. Maybe I’d been listening to too much news. When I recently got back to the book, I’m glad I returned to it. It’s worth the read. Running Against the Tide introduces Erin Travers and her two sons, Mike and Ryan. Nineteen-year-old Mike is the sociable one, willing to yarn with the kindly-and-not-too-nosy neighbours, oyster-farmer Jono and his wife Helen. Ryan is the one you have to worry about: taciturn, possibly anti-social – or a typical fifteen-year-old grieving the absence of his gambler father? Erin herself is struggling to find her feet back in the remote town where she grew up, dating again, but attracted to men who may not have her best interests at heart; struggling to find peace and privacy in a place where everyone knows each other’s business. Throw into this family mix bullying, intrigue, theft and arson and you have a good, suspenseful read. For me, the real star of the book is the setting, South Australia’s Eyre Peninsula, and the slow pace of life of Jono’s oyster farming. Well, almost. Jono is soon to discover even oyster farming has its trial. Ortlepp describes the remote coastal region of Mallee Bay with such precision and beauty I was sure the township must exist. I even looked for it on Google maps and congratulated myself when, after following the clue that it’s 500 kilometres from Adelaide, I worked out it must be based on the real-life town of Cowell. I needn’t have gone to the trouble: Ortlepp notes in the Acknowledgements that Cowell was the inspiration, a town where her grandparents lived in the latter part of their lives and which she visited as a child. Now I want to go there, too! If you like a mix of psychological suspense and intrigue with your family drama, you’ll enjoy Running Against the Tide. PS My novel Snowy River Man is now available in print as part of the “3-in-1 Australian Bestsellers” anthology, Country Secrets, published by Harlequin Mira, alongside novels by Mandy Magro and Sarah Barrie. To celebrate, I’m giving away two copies of the anthology to Australian residents, or your choice of either Snowy River Man or By Her Side as ebooks, if you’re outside Australia. You can find details on how to enter on my Lizzy Chandler author blog here. Entries close 31 August. This review forms part of my Australian Women Writers Challenge 2016. My thanks to the publishers for a review copy. On the back cover of my copy of Jodi Picoult’s Sing You Home is a quote from Stephen King: “Picoult writes with unassuming brilliance.” High praise from a master storyteller. Judging from the two books of hers I’ve read so far, I’d have to agree. Both The Tenth Circle and Sing You Home deal with domestic dramas and ethical issues. Both are lucidly written, with flashes of fine figurative language. Both use interesting structural scaffolding to support the story. Whereas in The Tenth Circle, Picoult counterpoints the narrative with a graphic novel version of Dante’s Inferno, in Sing You Home she uses music. Each section of the novel is a musical “track” relating to alternating characters’ points of view: Max, a recovering alcoholic who compares himself unfavourably to his rich, born-again Christian brother; Zoe, a music therapist, and Max’s wife of nine years, with whom he has struggled unsuccessfully to have a baby; and Vanessa, a school counsellor and acquaintance of Zoe, who invites Zoe to her school to work with a suicidal teenager. Part way through Sing You Home, the “music track” motif fades and segues into a courtroom drama. Zoe and Max battle it out over who has the right to a number of frozen embryos leftover from IVF treatment. Before the issue is resolved, Picoult touches on the question of the separation of the Church and State, and Christian dogma regarding homosexuality. In a tight, intelligent plot, Picoult conveys sympathy for – and insight into – characters of diverse opinion, behaviour and belief. There are twists and turns, and the climax is emotionally wrenching. It’s a very good read. 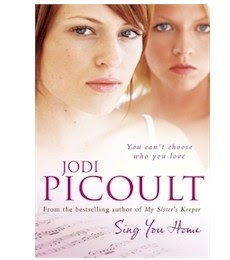 PS: Picoult’s publishers do her no favours with the girly cover. It barely relates to the story and screams “women’s fiction” or “book for women”. The issues the novel deals with deserve a wider audience. Told from the point of view of Adam Vander, a boy who has been kept locked away from the world by an abusive and controlling father, Through the Cracks traverses difficult territory. Adam has been victimised for so long, he exhibits all the hallmarks of “learned helplessness”: he has become so conditioned to abuse that he appears almost incapable of acting to stop it. Only as he hits puberty, and his father succumbs to health problems, does his sense of agency begin to assert itself. But how can he save himself when he knows nothing about the world, and the few people he encounters, apart from his father, don’t recognise him as someone who desperately needs help? Brown’s tale of Adam’s escape is both compelling and distressing. Slowly the events that led to his predicament are revealed, and the full horror of what he has endured unfolds. Along the way, Brown touches on issues of race, class, sexuality and, most importantly, identity. Who are you when everything that makes you human has been stripped away? One of the many elements of this powerful and emotionally wrenching novel that impressed me was its style. The sentences are often short and descriptive; the point of view character indulges in very little introspection and makes few inferences of other characters’ thoughts and feelings. It is as if one of the after effects of abuse is an almost complete lack of interiority. For me, this created an unnerving sense of Adam’s dissociation, his feeling of being utterly separate from the world, both emotionally and psychologically, even as he slowly rejoins it, just as formerly he was isolated physically. 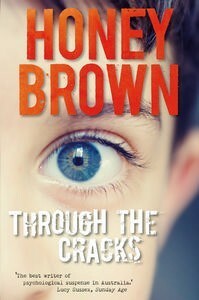 With Through the Cracks, Brown cements her place as one of the foremost writers of psychological suspense in Australia.